XR-5® geomembrane's resistance to high temperatures, ability to withstand chemicals and its high density, making it possible to install underwater. A next-to-impossible project in Lake Michigan near Chicago turned out to be very successful due to XR-5® geomembrane's resistance to high temperatures, ability to withstand chemicals and its high density, making it possible to install underwater. Because of a concern for industrial pollutants in the nation's waterways, the Environmental Protection Agency has strengthened its construction management standards. As a result, in 1981, the U.S. Army Corps of Engineers was required to submit an environmental impact study before dredging for the reclamation of 10 acres of Calumet Harbor on Lake Michigan. The Illinois EPA decided that dredging presented potential hazards and insisted that a liner be installed beforehand to prevent potential seepage of industrial contaminants into the lake. The Corps selected M.P.C. Containment Systems of Chicago to devise a containment system which would meet the regulated standards. The company had to build and line a dike 200 feet at a time in an area that was already filled with water and threatened by storms and high winds off the lake. The liner had to be able to withstand chemicals, oils, a tough environment and 50-pound stones which were dropped on it. Before choosing a liner, M.P.C. and the general contractor, Thomas Madden Company of Chicago, simulated the construction conditions at a nearby quarry to test the strength and durability of two different liners. 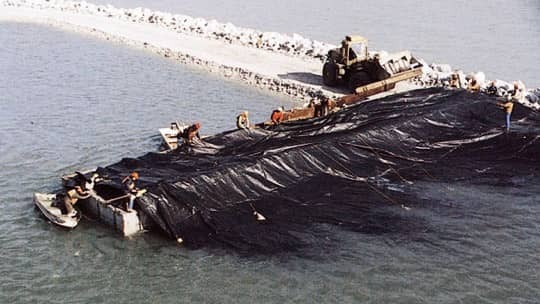 One was XR-5 geomembrane manufactured by Seaman Corporation, an ethylene interpolymer alloy membrane liner using DuPont's Elvaloy resin modifiers over Dacron polyester fiber. The other was an 80-mil unsupported polyethylene liner. To test puncture resistance, 50-pound stones were dropped from the top of the simulated dike. At the end of the trial, the polyethylene had a total of 50 punctures. The XR-5 geomembrane, with a breaking strength of 550 pounds per linear inch, had only two punctures. As a result of the testing, the companies also found that the XR-5 is more resistant to high temperatures, chemicals and oils, and the effects of weather and stretching. Furthermore, the XR-5's specific gravity of 1.3 made it easier to sink than the polyethylene, which has a specific gravity of less than 1.0. To install the liner, the fabric had to be placed over a prepared stone structure in 250-foot sections, sunk into place, and then brought back to the surface to be attached to the next liner section. It required a specially designed floating platform and a number of inflatable devices. As construction progressed, the floating platform traveled along the top of the dike so that the stone work and the liner installation could be done at the same time. The flexible liner was prefabricated into 23 sections varying in width from 60 to 100 feet and 200 to 300 feet in length. The sections were positioned in an accordion-fold along the top of the floating platform and welded together with a three-ply, tongue-and-groove construction to produce leak-proof seams. Hardware attachments were welded into the liner panels every three feet and connected to pneumatic lift cells. The liner sections were then deployed from the platform and sunk into position with ballast bags attached. With the liner in position, ballast stone was installed on top of all but the final 50 feet of liner. The uncovered liner was brought back to the surface by inflating the flotation cells. The edge of the liner was hauled onto the platform, dried, and heat welded to another prefabricated section, starting the sectional construction process over again. The U.S. Army Corps of Engineers was impressed with the speed of the liner's installation. After the workers gained experience, they were able to install 900 linear feet of liner per day. Construction of the 4,000-foot dike on the shores of Lake Michigan occurred in three phrases. The first phase required a dike to be built and lined at the shallow end of the harbor. In the second phase, a dike was built from the shoreline to the edge of the first dike, creating a small impoundment. In the third phase, the deep end of the harbor was dredged and the slurry was dumped into the small containment area after a dike extending into the deep area of the harbor was built to contain the slurry. To join the liners underwater, a mechanical seam with a zipper flap was developed so that it could be assembled easily under water. The zipper (two steel cables joined by a link) was prefabricated on both liner sections in the factory. The liner was sunk into place at the construction site and fastened to the main liner with two steel cables. The assembly was accomplished by a three-man diving team. Completed in August 1984, the dike consists of four layers: 4,000 linear feet of small prepared stone; the XR-5 geomembrane liner; 4,000 linear feet of ballast stone; and 2 feet of stone slab arranged in a pattern to break waves. According to the vice-president of Engineering for M.P.C. Containment Systems, the installation saved $4 million over other bids and was completed nine months sooner than projected.